AccuWeather reports a major storm will bring heavy late-season snow and blizzard conditions from portions of the northern and central Plains to the Upper Midwest from Friday to Sunday night. The worst travel conditions are likely to be centered on, but not limited to, the Interstate 35 and 90 corridors. Airline passengers should anticipate major flight delays and a high number of flight cancellations centered on the major hub of Minneapolis. 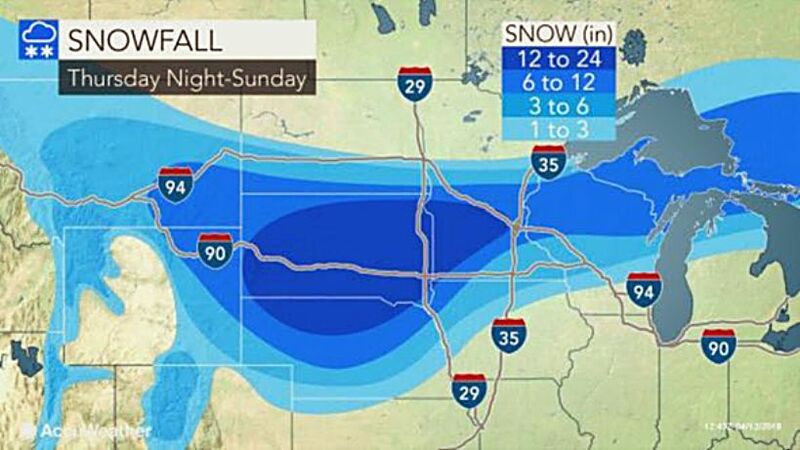 The area likely to receive between 6 and 12 inches of snow is forecast to extend from eastern Montana to northeastern Wyoming, much of South Dakota, southern North Dakota, northern Nebraska much of southern Minnesota and northwestern Wisconsin. 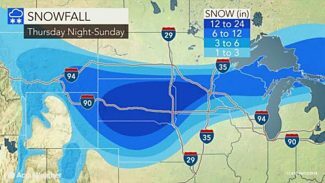 Blizzard conditions are projected for much of Nebraska, South Dakota and southern North Dakota to central and southern Minnesota to northern Wisconsin. The storm has the potential to bring 1 to 2 feet of snow to part of the same area that is likely to experience blizzard conditions. Other major cities in the region likely to be adversely affected by the snowstorm include Sioux City, Iowa; Valentine, Neb. ; Rapid City, Huron and Pierre, S.D. ; Miles City, Mont. 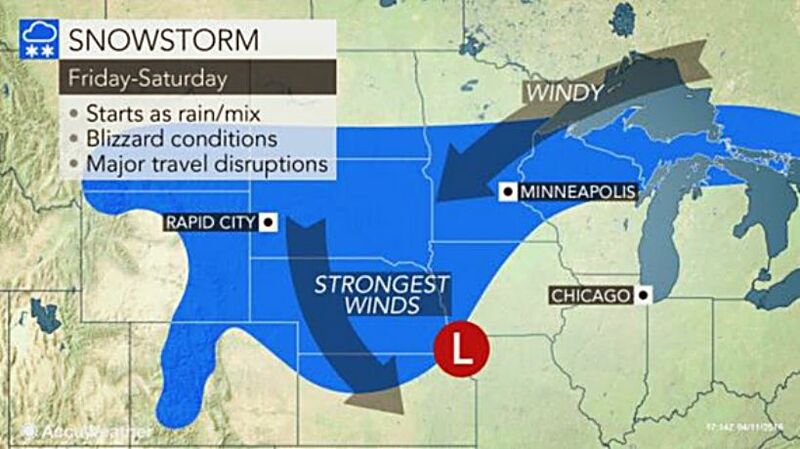 ; Ortonville, Minn.; and Eau Claire, Wis.
"The strong wind aspect of the storm, in lieu of snow, can lead to power outages and property damage over a broad area of the Plains," according to AccuWeather Senior Storm Warning Meteorologist Rich Putnam. Operators of high-profile vehicles should be prepared for difficult cross winds along portions of I-25, I-29, I-35, I-70, I-80, I-90 and I-94. Significant turbulence is likely and may lead to issues during landing and takeoff well away from the center of the blizzard and may impact the hubs of Denver, St. Louis and Chicago. The same storm will parent a multiple-day severe weather outbreak south and east of the snow area from Friday to Sunday. 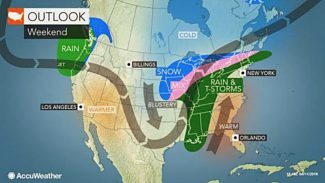 In addition to heavy snow, blizzard conditions and severe thunderstorms, a significant buildup of ice may occur in parts of Ontario, northern New York state and northern New England. Strong winds will lead to areas of blowing dust and an elevated fire risk to end this week over the Southwest. During early next week, the storm will pivot northeastward toward Hudson Bay, Canada, and colder air will be funneled across the balance of the Midwest and into the northeastern United States.